Last month, I went to Rome and had the most incredible time. Rome has been one of the top places on my travel wish list for a long time and was so excited when my friend (Jess) and I booked the trip in March. Rome is such a beautiful place and the pictures just don't do it justice, around every corner there was something new to discover and the architecture was simply incredible. Gelato lives up to the hype and I honestly could eat it every day! We set off early Friday morning (3am to be precise) and got to Stansted Airport just around 6am, I was so excited that words couldn't even begin to explain. Although slightly nervous as I hadn't flown in over 3 years and unfortunately Jess and I discovered the day before we wouldn't be sat together on the plane (stupid Ryanair booking system). Jess got sat next to a lovely couple and I got the short end of the stick, I was sat next to a young couple making out half of the time and taking up all of the room, not only that but they shut the window so I couldn't even look outside! After a grim flight, we finally landed in the afternoon and then proceeded to get a coach transfer to central Rome. We eventually got to our hotel just after 5pm or maybe later, we were both exhausted by that point and just couldn't wait to get something to eat. We had a lovely meal at a restaurant round the corner and it was very reasonably priced. Our hotel was stunning and was way prettier than beyond our imagination, we even got upgraded and ended up with jacuzzi bath! We stayed at MDM Luxury Rooms and I could not recommend the place more. 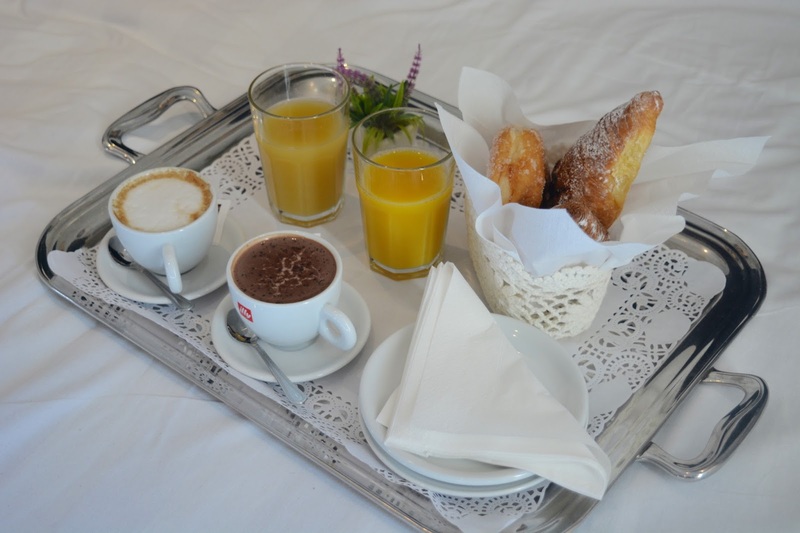 Included in our deal was breakfast in bed every day and you even get everything free in the minibar on the first night. The pastries were lovely and it was so cute having breakfast brought to out room every day. Our second day in Rome, mainly consisted of exploring and eating lots of food. First on the list was the Colosseum and I absolutely loved it, it was stunning and so mesmerising. I honestly could have looked at it all day and when I go back to Rome, I would definitely go back there again. We then walked around Palentine Hill, which is near the Colosseum and full of old ruins + historical architecture. It was lovely to walk around and you need a good couple of hours to properly explore it. Next on our stop was the Trevi Fountain, which need I say more was amazing. I also had my first gelato and boy does it live up to the hype! There is a reason why gelato is unlike any other ice cream in the world, it is simply the best. On Sunday we visited the Pantheon, an art museum and just generally explored Rome. The Pantheon is wonderful on the inside, the ceiling is fascinating and I was in awe of everything in the building. Barbarini and Spagna are beautiful areas, Barberini was my all time favourite (it's where the Trevi Fountain is and lots of shops). We also found the best place for cocktails there and had an amazing last night. Pepy's Bar was lovely, it had great food and the tastiest cocktails. I absolutely loved my time in Rome and will definitely be going back, there is so much to see there and four days isn't enough time. I really want to see the Catacombs, discover more of Rome and just eat more gelato. It is beautiful there and I honestly could not say anything bad about the place. Get a Roma Pass, it came in so handy and made travelling around Rome on the tube so much easier. Wear trainers, you do so much walking in Rome that even flat sandals hurt your feet eventually. My feet felt crippled on Sunday after wearing my sandals all day on Saturday and just wore my trainers from that point on. Bring a backpack, it makes it so much easier for those long days and keeping a water bottle on you, especially if you bring a big camera like I did. Check what is open before you go and make sure you plan out where you want to go. Be careful when crossing the road, honestly they drive insanely and go through red lights. Pedestrian right of way means nothing there and cars drive through even when it isn't their turn. If you visit the Vatican, Sistine Chapel and St. Peter's Basilica you will need at least half a day. There are so many rooms in the Vatican and St. Peter's Basilica has a different entrance. Get coach transfers, they may be cheaper but seem to come & go to their own timetable. They also get full really quickly and take twice the amount of time than actually told. Go on guided tours, they take twice as long and you end up paying more. Just queue, don't take any shortcuts! It's not worth it trust me and all the tour guides are full of lies, we fell for this twice and ended up wasting time/money.